Michael Brown, an 18-year-old African American youth, was shot at least six times by a Ferguson, MO white police officer Darren Wilson according to the preliminary results of an independent autopsy requested by the family. The fatal shot went directly through the top of Brown’s head into his brain, killing him immediately. There are numerous eyewitnesses to the killing of Brown. A cellphone videotape captured the scene minutes after the youth was gunned down in the street while police stood around talking. When Brown’s family members attempted to take a look at the body, theywere pushed away by the Ferguson police. The name of the officer was not released until six days after shooting. On the same day as Wilson’s name was released, a video was issued by local authorities in Ferguson which purportedly showed someone resembling Brown taking a box of cigars from a store and pushing a clerk. The contents of this video and the timing of its release further inflamed tensions in the African American community. On the evening of Aug. 15 after the release of the video attempting to criminalize Brown, the store in question was trashed. This took place a day after the St. Louis County police were ostensibly pulled back while being criticized in its brutal actions against demonstrators,community members and even members of the media. Gov. 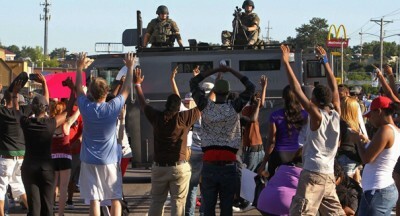 Jay Nixon, a Democrat, supposedly made the decision to lighten upon the police repression. He was called by President Barack Obama who was attempting to reduce the damage these developments have had on local, state and federal governments in the United States. Nevertheless, by the morning of Aug. 16, riot police units were called back into the unrest areas in Ferguson. On the evening of Aug. 17, police claimed that they were fired on and attempts were made to put up barricades to hold back law-enforcement and to overrun the command center. These claims were made in an effort to justify further repression.Gov. Nixon announced that he was deploying the National Guard in an effort to quell the unrest. A curfew was imposed on Aug. 15 resulting in mass efforts to defy the orders that people leave the streets by midnight. On Aug. 17, militarized police units attacked the people gathered in the streets more than two hours before the curfew was scheduled to go into effect. Nixon announced that the curfew would be lifted on the evening of Aug. 18, but that the National Guard would be deployed to maintain order. Brown was wounded four times in his shoulder and arm with an additional bullet going through his mouth. The fatal wound was apparently the final one which takes on the dimension of an“execution-style” killing. At a press conference held in Ferguson called by the family of Michael Brown, Atty. Benjamin Crump acted as the chief spokesman and conveyed three questions being asked by Lesley McSpadden, the mother of the 18-year-old student who was struck down on Aug. 9 while walking to his grandmother’s home. McSpadden wanted to know how many times her son was shot. Whether Brown suffered prior to his death and finally, why hasn’t the police officer who killed her child been arrested. Crump served as the lawyer for the family of Trayvon Martin who was killed by George Zimmerman in Feb. 2013. Like Brown, his death galvanized African American communities across the U.S. and prompted world news coverage of the killings and demonstrations organized to seek justice. President Barack Obama has spoken twice on the situation in Ferguson.During his vacation on Martha’s Vineyard on August 14, he was compelled to address the crisis after six days of mass demonstrations both non-violent and violent. Obama said that the U.S. was “one country with common values” and that the situation in Ferguson must be resolved through peaceful means admonishing those who engaged in attacks on private property and police. Nonetheless, if the U.S. was one country then there would not beperiodic urban rebellions throughout African American communities nationwide. Many of these outbreaks are fueled by blatant acts of police misconduct and brutality. The situation in Ferguson is by no means an isolated incident. Since the times of slavery, Africans have resisted national oppression, racist violence and economic exploitation. To suggest that both the oppressed and the oppressor have equal responsibility in a situation that was clearly provoked by the police, the authorities in St. LouisCounty and the state of Missouri, is disingenuous to say the least. In a second press conference on Aug. 18 after Obama’s return to the White House, he mentioned the situation in Ferguson again. Initially however, as on Aug. 14, he discussed the current U.S. military intervention in northern Iraq through aerial bombardment and ground operations. Obama sought to justify the deployment of U.S. “military advisors” and fighter jets in Iraq over the last several weeks. He said that civilians were being threatened and the Islamic State needed to be curtailed and contained. The president never acknowledged the role of the U.S. in destabilizing Iraq and creating the conditions for sectarianism. The Islamic State formerly known as the Islamic State of Iraq and Syria (ISIS) or the Islamic State of Syria and the Levant (ISIL), has been fighting against the government in Syria on the same side as Washington which is committed to overthrowing the presidency of Bashar al-Assad. When asked during the question and answer period whether he had any reservations about the militarization of the police, where they are given hundreds of millions of dollars in defense equipment utilized in war zones, the president refused to address this inquiry directly.Obama made reference to the aftermath of 9-11 as a reason for the militarization. However, the situation in Ferguson is not at all similar to the attacks on the World Trade Center and the Pentagon in 2001. It was the actions of a white police officer, a department where he works, a county law-enforcement militarized response and the governor who has refused to address the oppressive conditions under which African Americans live and instead sent in the National Guard to suppress the mass response to such an injustice. In addition, the only programmatic response to the questions about the social conditions of African American youth in contemporary U.S.society, Obama only discussed his so-called “My Brother’s Keeper”project which in essence places the onus of responsibility for living in a racist-capitalist society on the victims themselves, not providing any assistance from the federal government and the corporate institutions which are at the root of the mass unemployment, underemployment, poverty and incarceration prevalent among tens of millions of African Americans. Obama said that many people of color do not feel they are a part ofthe broader society. The fact is African Americans and other nationally oppressed groups are not treated equally and are systematically discriminated against which manifests itself through disparate treatment due their race and social class. Until these issues are corrected, unrest, both nonviolent and violent, will continue throughout the U.S.
To advance demands for self-determination, national liberation and full-equality on a political level it requires the mass organization of the oppressed in alliance with the working class as a whole. The only way racism and national oppression can be uprooted and destroyed in U.S. society is to fundamentally transform the system of racial capitalism.